Keeping with the stitching to preserve what’s left of my sanity. My niece reached out to me after the election and we’ve been able to reconnect and catch up a bit in the days since. She’s one of the few younger folks in the family who’ve spoken up to say that she likes my stitching – and that she had a couple of kids who’d appreciate receiving hand-stitched ornaments. 🙂 I hope it’s true. 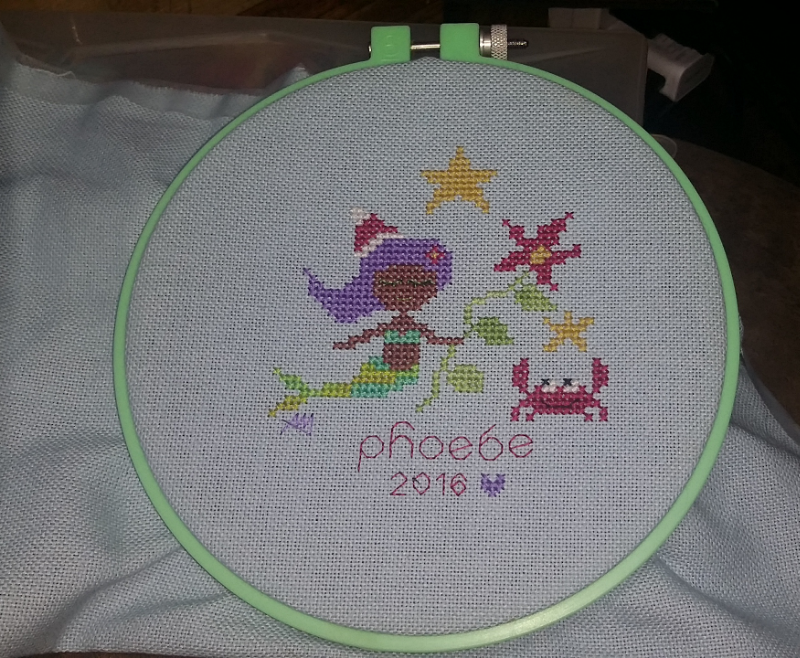 I took the template for this from a summer mermaid chart from the Snowflower Diaries and had a ball making changes based on what I’d been told of her preferences. What fun. This is 28 ct light blue monaco, stitched over 2 with cotton flosses. The flower stem is a variegated green from The Gentle Art. The rest of the flosses are DMC. I’m still mulling how to finish it. There’ll be another pic when the get that part sorted.